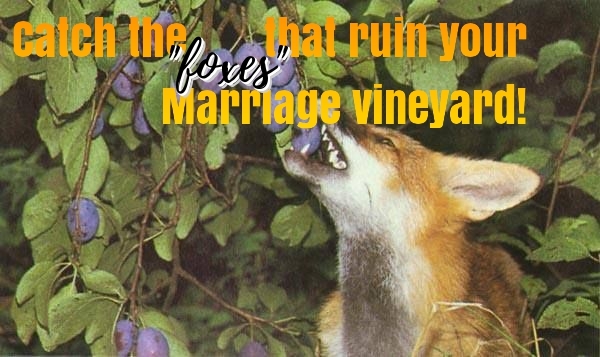 Catch the “foxes” that ruin your Marriage vineyard! – FOX CALLED FAMILIARITY! Happy 2017! It’s another year given to us by the Lord and I thank Him for it. Every day we wake up fine, and well, and get to impact one life, one marriage, one relationship, one man, one woman, all glory and honor goes back unto the Lord. Hopefully this year brings a renewed energy and strength to fight for our marriages and the keep saying that marriage does work! The Lord has told us to tell Him the desires of our hearts and He will bring them to fruition, not by our own will but His be done. One thing I have constantly asked of the Lord is to teach me to be a wife to my John every day, every minute, every second. Let me give you an example. When you first saw this lady, the skies lit! She was your gem and you were her knight in a shiny amour. Both of you took nothing to chance. You woke up in the morning, and she was the first thing on your mind.You chatted the night away, and never forgot her birthday or any special occasion in her life. She kept you encouraged and always reminded you how strong a person you were. The notes, the cards, the phone calls, the flowers, the gifts, you were both so in love. Your hearts almost “beat as one”. Frenetic and exhilarating love right? I know, we have all been there…which is good. Nothing cliché about it. It’s alright. After a couple of years, you both decide to settle down and spend your lives together. After all you have found each other! Year 1, year 2…you begin to get familiar with each other. Your routines are very predictable. Wake up, go to work, come in the evening, take a shower, cook, watch news, and retire to bed. If you have children, you attend to them before retiring to bed. The routine becomes too obvious, and lacks spontaneity. It’s true; the hustle and bustle of life can cause life to sometimes become “too obvious”, a marriage stuck in a 24/7 rut! Let me say this, marriage is one place where stability is of utmost importance, but so is a little room for adventure and spontaneity. I really understood the 1st thing. Infidelity. I mean, we wouldn’t want to undergo marital infidelity in our marriage, but do you realize that getting familiar with your spouse too can cause the two of you to drift apart? It’s always a slow fade. Divorce doesn’t just happen. It was a slow fade. One of you or both of you let go of your vows way too early. You got emotionally disconnected way before the physical manifestation came. They say “familiarity breeds contempt”, and I couldn’t agree more. If you become familiar with your spouse first you become ASSUMPTIVE. You assume their every move. You assume you know what they want or need. You assume they will be happy with you going a certain direction. You assume what they will wear or eat. You assume how they will react. You assume their reaction. You assume everything. Johnny and I have had a couple of fights over assuming each other’s needs, until we learnt never be assumptions. Yes we might have known lots of things about each other over the years we dated, but we resolved not to ASSUME WE KNOW. He might have known how I will react to a certain issue, but he has learnt never to assume that my reaction then will be my reaction now. So have I. Is it easy? No its not. You have to learn to unlearn a couple of things! I have learnt to ask, “Hunnie what will you drink?” Instead of assuming he wants tea, coffee or juice. Yes it seems pretty petty, but I have learnt to ask. I have learnt to ask “what do you think of this”, instead of assuming I know just because yesterday and the day before he got to say the same thing. We have learnt to ask, “why”, “how do we go about this” and “when do we do this”. Does it come naturally? Certainly it did not for us. No! It takes work. It takes a deliberate effort. Of course there are times I just serve him whatever is in the kitchen, but I have learnt to ask, because it’s one of his needs. He doesn’t like familiarity. Another thing familiarity does, is that it breeds DISREGARD. Subtle or otherwise, it’s still ignoring. You “stop” putting the effort you were initially in making your relationship work. You stop surprising him, and he stops too. The random movies, the surprise bouquets of flowers to her office, the planned or unplanned getaways, the hikes, the random walks after church. You both simply ignore…again consciously or not, it all stops! You quit all that “just because” you are both married now. After all, you have a house now. Instead of “wasting” the money in the hotel, you would rather buy a packet of “pembe” and “sukumawiki”, cook and eat. Don’t get me wrong, am not against that. In fact I love ugali and sukumawiki, they are my favorite… I love my time with my hubby in the house; a whole week can pass indoors. You stop going that extra mile for each other. After all is said and done, you begin PRESUME you know. You begin presuming their moves. You presume what your husband would want that and you really don’t bother asking him about it. He presumes what you need. He presumes your steps, and you presume his. The effort ceases, marriage spark goes, and soon the drift starts. It’s a dangerous weed in all marriages, and the easiest to creep in. Do not let the fox grow. Abort it fast! Do not let familiarity set in. Make an effort to do those “little things’ together and for each other. Is it easy? No, but if you are determined to have one stupendous marriage on earth, you will make the effort.